Each year, universities from all over the United States compete in the nationally recognized competition known as "RecycleMania". This past season, Grand Valley State University took eighth place in the recycling category as well as 12th in overall diversion rates. In 2001, RecycleMania began as a contest between Miami University and Ohio University as a way to promote recycling efforts on each school’s campus. The competition saw an increase in campus recycling participation and has since expanded to more than 150 colleges and universities. With no end in sight to Michigan’s winter weather, many people find themselves reminiscing on warmer days and missing their suntanned skin. This desire to look tan is particularly prevalent among college-aged women, many of whom turn to tanning beds to achieve that bronzy glow. However common tanning may be, there are many proven negative effects associated with using tanning beds. Grand Valley State University is just one of two public institutions in Michigan that has yet to go tobacco-free. In late March, GVSU student senate voted against supporting a proposal that would implement a tobacco ban on the university's campuses. The proposed ban wasn't just limited to traditional cigarettes: Vaporizers and e-cigarettes also fell under the proposal. At Grand Valley State University, the "Laker Effect" can be described as an ongoing effort where students and staff work to positively impact the community, the state and the world. Recently, one of the ways the Laker Effect has been impacting the local community is through the GVSU Ambassadors of Environmental Education project. 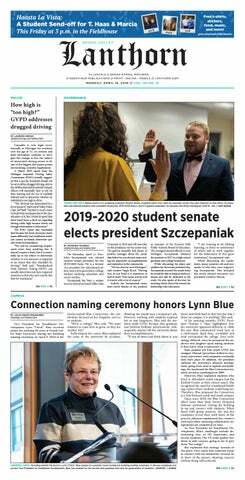 Grand Valley State University student senators voted against supporting a proposal for a smoke-free campus Thursday, March 29. There was a small gas leak at Kistler Living Center on the Allendale Campus Tuesday, March 27. The leak was from a one-inch line outside the building and possibly related to a water leak. Residents were evacuated as a precautionary measure only. DTE was on the scene to turn off the line. No one was injured as a result of the incident. UPDATE: DTE has shut down the line, and residents are being allowed back into the building. In the continued wake of President Donald Trump's decision to pull out of the 2015 Paris Agreement, some citizens remain skeptical of the federal government’s role in implementing goals to mitigate climate change and improve conditions in cities across the country. Marina Kaneti, Grand Valley State University professor of global studies and social impact, worked alongside four students to develop the Sustainable Development Goals (SDG) compact, a system of goals that works to involve cities and local governments in achieving sustainability objectives. Grand Valley State University students interested in learning more about Grand Rapids’ sustainability initiatives will have the chance to do so next week. The GVSU Urban Planning Association (UPA) is bringing in engineer Carrie Rivette, Grand Rapids stormwater manager and lead on green infrastructure, to speak in Mackinac Hall B-1-118 on Monday, Feb. 12, at 7 p.m. The main topic of discussion will be green infrastructure in Grand Rapids.